Since it rented by the month and my parents didn’t want to fly, we made the decision that I would accompany them and help make the drive down. I was thrilled beyond words … never in my wildest imagination did I think I would ever have the opportunity to spend 30 days on the beach! 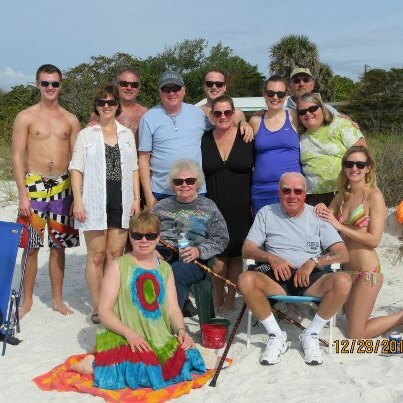 The beach was awesome … but the real gem in this equation was spending 30 days with my parents. It was a wonderful experience, and the best gift I could have ever been given. We relaxed, we drove around and visited all the places that my parents had been over the 40 plus years that they had been traveling to Florida. We even visited every golf course that my Dad had played on. It was a trip through time and revisited fond memories. We got fresh grapefruit right off a tree in our yard, we got fresh oranges from a Mom & Pop orange grove, we bought fresh sea food from roadside stands and ocean fish markets. We read books, we sat on the beach and watched dolphins and stingrays swim by. We watched birds dive bomb into the ocean for food. We enjoyed the gift of time. We eagerly awaited the arrival of the rest of our family so we could all enjoy the beauty that was Anna Maria Island. But all too soon our time was up. We spared Mom & Dad the long drive home and got them a flight back home. My Dad called me excitedly to tell me that he had upgraded so that they could travel first class on what may be the last plane ride they make. It seemed a fitting end to a wonderful month. My nephew Thomas turned 19 on December 28th so we all went out to a seafood restaurant and celebrated his big day. Roger and I celebrated our 33rd wedding anniversary on December 29th. The “young ones” of our family were cooking that night so instead of going off on our own, we elected to stay home and enjoy home-made pizza and play games. Roger and I spent the first night of our drive home in Smyrna, Georgia … we got to spend quality time with Roger’s Uncle Kenny, sharing a meal and getting the tour of town, including a visit to his home. Another priceless first on this grand adventure of ours. The final night, which was also New Years Eve, was spent in Urbana, Illinois. We were exhausted after driving for 12 hours so we celebrated with supper at Perkins, a hot shower, and a very comfortable bed. The next day we arrived back in Minnesota and HOME! As much as I love to travel, I also really love my home. There really is “no place like home.” I had never been away from home for this length of time before and it felt like a long awaited reunion with a favorite old friend. My dog, Murphy, however, had other ideas. As ecstatic as I was to see him, he was mad at me for being gone for so long — a first in a 13-1/2 year history with him. But I couldn’t say I blamed him. How do you explain to a dog that you are going to be gone for so long, but you WILL be coming back? I’m sure in his mind he didn’t think I would ever return. I am happy to say though, after being home for a week, all has been forgiven and Murphy and I have seemlessly slipped back into our daily routines. 2013 is a new year full of hope and promise. One thing is sure though — things will not stay the same. Time marches on — even though sometimes we don’t want it to. Wishing you and your family the hope and promise that this new year brings! ← I Am So Grateful ….